This is Steven, the Seika CIR. I regret to inform you that this will be my last article for this blog. Starting at the end of July, I will be moving to Shizuoka Prefecture to work at the prefectural office there. While I was in Seika, I had many wonderful opportunities to interact with the townspeople and share my culture. I strongly feel that I made the most of my two years here, and I hope to make the most of all my experiences here in the future. I hope that the people I met got something from their time with me, and I hope that the readers of this blog found something interesting in my articles. There will be a new CIR in Seika after I leave, so please be sure to pay attention to his endeavors, too. While I am looking forward to the charms that life in Shizuoka will bring, I will certainly miss everything I have here. Thanks for everything, Seika! Hello everyone, this is Steven from Seika. I would like to tell you about two events I attended with Brian from Kizugawa. The first was the Citizens of the World Workshop on Sunday, June 15th. The second was a one-day summer camp experience event on Saturday, July 12th. The Citizens of the World Workshop featured me, Brian, and several other people from Brazil, Thailand, and China as guests. All of the other participants were Japanese. Here’s what Brian had to say about it: “I joined the ‘Chikyukko Koza’ event in Seika and had the chance to interact with some high school students from Horikawa SHS and middle school students of Seika. We played a card game about the food culture of many countries and we listened to the students present on world cuisines. I started missing Mexican food a lot during the presentation. Coming from California, where Mexican food is very common and popular, I hope Japan will have a ‘Mexican food boom’ sometime soon! The summer camp experience event was run by me, Brian, and the CIR from Kyotanabe named Polly. We introduced games, songs, and dances from America and the United Kingdom to elementary school students from Kizugawa, Seika, and Kyotanabe. That wraps it up for now. Stay cool this summer, everyone! Summer has finally come. What are your plans? Today I would like to tell you about an event I did on June 15th. I invited 3 Assistant Language Teachers (ALT) working in Kyoto Prefecture high schools to come and talk about English language education in Japan. 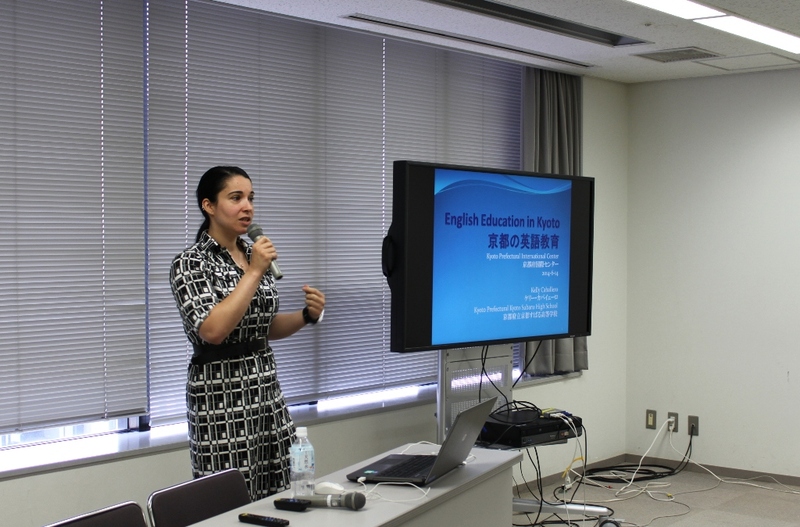 With the Olympics in 2020, English education is becoming more and more important in Japan and in Japanese schools. This trend could be seen in the number of applications we got and the popularity of the event. Our first speaker was Erin Noxon. 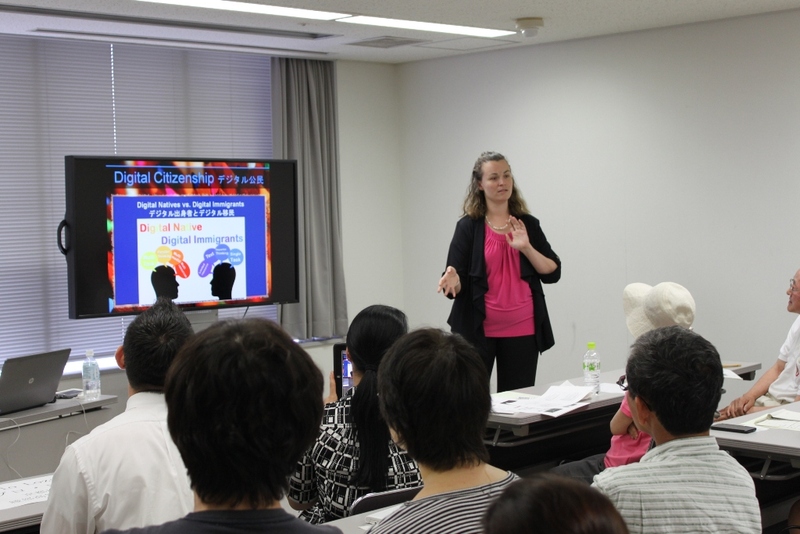 Originally from the US, she is now teaching at Sagano High School. She told us about educational technology, a new concept emerging with all the new technologies available nowadays and how they can be used to help improve language learning and the experience in the classroom. She told us how students can be considered “digital natives” which means they were used to new technologies (IPads, smartphones, networks, computers etc.) ever since they were kids, and that teachers are mainly “digital immigrants” which means they have to adapt and learn how to use these technologies. Based on the use of these technologies and categories of people, she talked about the differences in the learning process and how teachers can use them to their advantage when teaching. Our second speaker was Pablo Lozada. Born in Mexico and raised in the US, he is currently teaching at Ayabe High School. He talked about psychology in the classroom, and how he established rules for team teaching to get the students to be more involved and so they clearly see the goals of each class. He gave us indications about the do’s and don’ts to have an effective team teaching and responsive classroom. 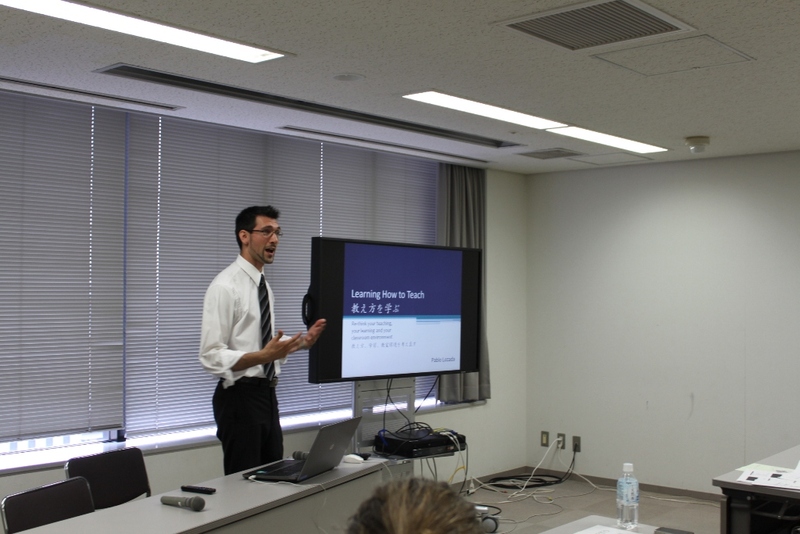 The last speaker was Kelly Caballero, from the US as well and teaching at Kyoto Subaru High School. She spoke about what she does and her duties in her school so people know what ALTs are and what they do in their everyday work. Her high school being a business school, her students have special projects such as learning about Kyoto culture and introducing it to foreigners (the Gion festival for example), or creating their own department store for a few days and selling original products using local ingredients and culture. Thanks to the 3 of them, participants were able to have a deep insight into the diversity of an ALT’s job and the various aspects of English education. 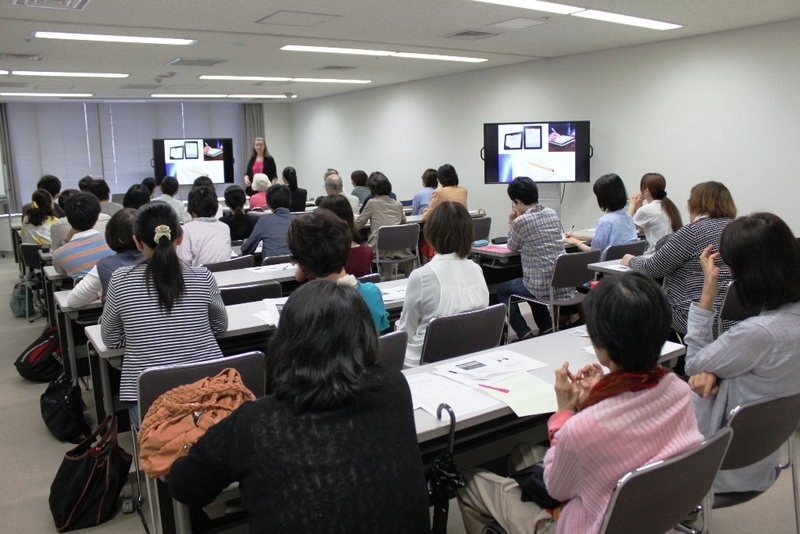 The talk was also entirely in English, so I hope it helped the participants with their practice of the language! フランスサロン特別講演　参加者募集！ – Looking for participants for the next France Salon! Alice from Kyoto Prefectural International Center. We are looking for participants for the next France Salon on July 19th (Sat) from 14:00 to 16:30. Please come! We will project in Kyoto for the first time the movie “Misasa’s Kids’ Adventure” made by Anthony Lieven, the French CIR in Misasa Town (1 hour). After the projection, Anthony will speak about this local movie project and how movies can help promote a region both to the domestic and international level. ※This lecture will be held in Japanese.